For the Silver Wraith II, see Rolls-Royce Silver Shadow. The straight six-cylinder postwar engine, which had been briefly made for the aborted by war Bentley Mark V, replaced conventional overhead valve gear with an F-head configuration of overhead inlet valves and side exhaust valves and reshaped combustion chambers. There were new main and big-end bearings and a more efficient drive to the timing gear. To this prewar mix Rolls-Royce added chromed bores. Initially, this engine retained the Mark V's capacity of 4,257 cc (259.8 cu in) increased from 1951 to 4,566 cc (278.6 cu in) and in 1955, after the introduction of the (standard wheelbase) Silver Cloud, to 4,887 cc (298.2 cu in) for the remaining Silver Wraiths. From 1949 until 1955 customers wishing to buy a Rolls-Royce fitted with a much smaller standard steel body could purchase the Silver Dawn. It rode on a chassis seven inches shorter than the Silver Wraith, and was almost identical to Rolls-Royce's Bentley Standard Steel saloon available alongside the Silver Wraith since July 1946. Initially only a four-speed manual gearbox was offered, but this was supplemented by a General Motors Hydramatic automatic option from 1952. 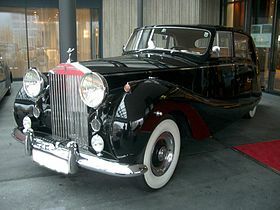 By this time Rolls-Royce's other model was the Silver Cloud, and the Silver Wraith had come to look fairly similar to it—inset headlights, higher fenders, etc. ^ Culshaw & Horrobin 2013, pp. 252. ^ a b "Spring Collection: Selection of new models announced at this week's Geneva Show". Autocar: 22–24. 19 March 1977. Wikimedia Commons has media related to Rolls-Royce Silver Wraith.